If you have an old mattress or you sleep on a bed that you never really thought was as comfortable as it should be, we’ve got a solution that’s way more affordable than coughing up the cash for a new mattress. Check out the Extra Plush Bamboo Mattress Pad with Fitted Skirt by ExceptionalSheets. With about 3,500 5-star reviews from customers on Amazon, this is one of the best-rated bedding products on the site. It feels like you’re lying on a cloud and it comes in all sizes, from Twin all the way up to Queen and King. Grab one now and you’ll save $30 on any size topper if you clip the on-site coupon, making these already affordable mattress pads an absolute steal. SIZE & DESIGN – Queen Mattress Pad | 60″ x 80″, This mattress pad is perfect to revitalize your sleep and will fit mattresses up to 18″ deep. Laboratory tested and certified safe according to Consumer Product Safety Commission 16 CFR Part 1632 without the use of flame retardant chemicals. 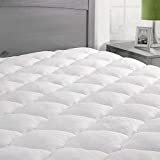 GUARANTEE – We have sold over 1 million mattress pads and customer satisfaction is our top priority with each transaction, money back guarantee if you are not 100% satisfied.